The police have named this new repressive coup against anarchists ‘Operation Erebo’. In Greek mythology, Erebus (blackness) was a primordial god of darkness and shadow. According to the forces of repression, this raid is a part of an investigation which began a year ago following an attempt to attack a police vehicle outside a police station, an investigation that involved more than thirty suspects, among whom, according to the director of the Metropolitan Police (Fabio Motta), were people from Brazil, Chile, Bolivia and France. According to comments to the press by the head of the Civil Police (Emerson Wendt), these people had formed an organization that stands “against all forms of power, control and morality in society”. The spoils of war stolen by the bastards are the same types of material already well known from other repressive operations in the region, such as the case of Operation Salamander (‘Bombs Case’, Chile 2010) or the repression against anarchist spaces in Bolivia during May 2012: books, masks, leaflets, posters, computers, and in this case a large number of eco-bricks that are being presented by the police as Molotov cocktails. The charges brought by the repression include: attempted murder, criminal organization, gang formation and damage to public heritage with explosive material. For its part, the local press plays its role as miserable collaborators to validate and justify the repressive operation. 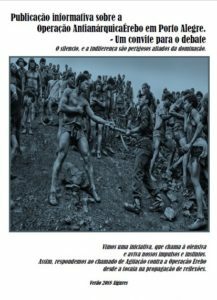 In one of the newscasts, a reporter displays in his hands (without gloves) a piece of the evidence that they consider conclusively proves the dangerousness of the alleged criminal group: a copy of the book ‘Chronology of Anarchic Confrontation’ which is documents actions carried out in the territory dominated by the State of Brazil. 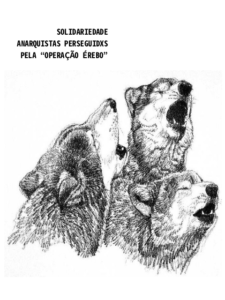 Beyond the evidence and the accusations, we see once more how the repressive strategies of states are being internationalized against anarchist spaces and comrades to try and slow down the anarchic struggle in all of its forms and expressions. Faced with this, our response can be none other than international solidarity and cooperation and the strengthening of networks of action and to promote the anarchic offensive at war against States and all forms of power. 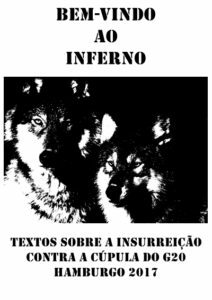 From Chile to Brazil, solidarity, agitation and direct action against all authority! 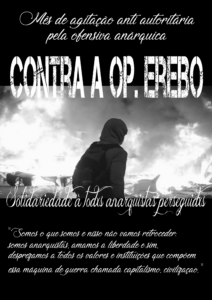 This entry was posted in ENGLISH, TEXTS and tagged Operacao Erebo. Bookmark the permalink.